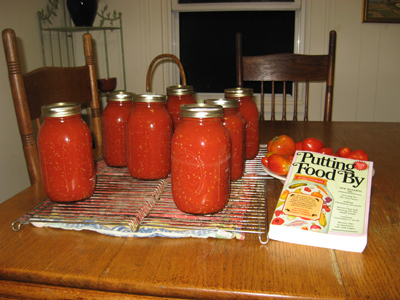 I canned close to 200 paste tomatoes over the last two days. I am not happy with the results. That’s an incredibly discouraging statement to make, considering the amount of work that was involved. I followed all instructions, but what I spooned into the hot jars was liquid, and not chunks of paste tomatoes, as I expected. Perhaps the liquid will be acceptable as the base of future sauces or soups. I will let you know. For now, let me share a few photos of the process, because tomatoes always look good on film, whether they’re behaving or not. 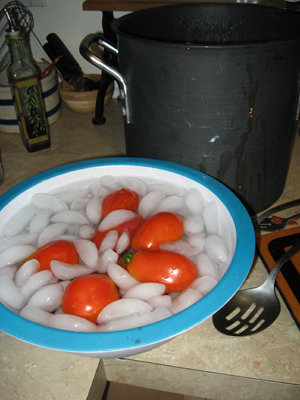 I did the fire-and-ice routine with these tomatoes, too, and am getting pretty good at it (aka, faster). Off comes the peel. 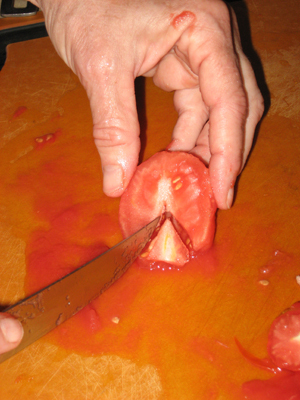 The smaller paste tomatoes are much easier to handle and the peel comes off in one piece. I took out the tough core by slicing a triangular wedge from each half. Everything with these guys was on a smaller scale, even the pith. 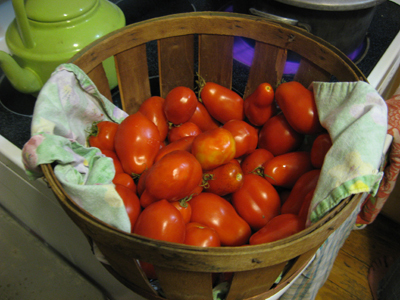 I peeled the tomatoes one week-night, and it took close to 4 hours. I put the halved/quartered fruit into my deep stock pot, and refrigerated it over night. 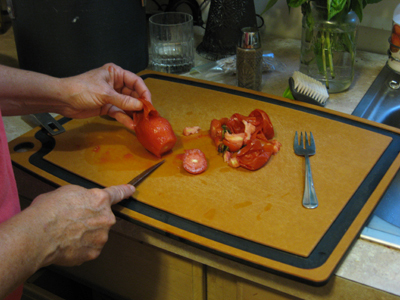 Last night, I heated the chopped tomatoes as instructed, and all of the beautiful pieces dissolved into liquid. I cooked it down a bit, but what I spooned into the scalded jars was liquid, and not chunks. Seven quarts cooling, along with the book that I followed for instructions. Soup, anyone?! Actually, this is not so bad. I will set these seven jars on the back of the shelf, and mentally label them “January Comfort.” That’s when lunch is often a thick hearty soup and dense bread. Ok, I’m feeling better now! “At what point did we realize we were headed for a family tomato harvest of 20 percent of a ton? We had a clue when they began to occupy every horizontal surface in our kitchen. By mid-August tomatoes covered the countertops end to end, from the front edge to the backsplash. No place to set down a dirty dish, forget it, and no place to wash it, either. The sink stayed full of red orbs bobbing in their wash water. The stovetop stayed covered with baking sheets of halved tomatoes waiting for their turn in the oven. The cutting board stayed full, the knives kept slicing.